Factory Cat model TR is an industrial grade, self-propelled, rider sweeper, manufactured in the United States of America. 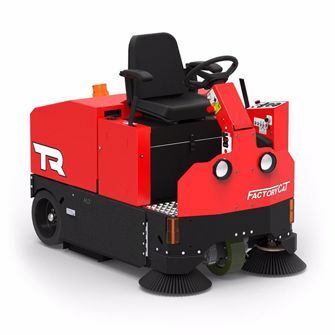 The TR rider sweeper is ideal for sweeping small and large debris on any hard surface floor. The TR rider sweeper also makes an excellent carpet sweeper for large areas. At the recommended operational speed of 3.0 MPH the TR rider sweeper cleans at the rate of 60,000 square feet an hour. With fully charged batteries, the TR rider sweeper will sweep between three and five hours. With the optional battery upgrade package installed, the TR will sweep for up to eight hours. Key ignition switch, horn, headlights and strobe light are all standard features of the TR rider sweeper. An optional integrated operator safety switch stops the TR rider sweeper unless the operator is seated. Simple manual brush levers raise and lower all brushes, and are within easy reach of the operator. Side brushes automatically turn off when the brush lever is raised. Dual Side brushes, heavy-duty poly rollers, and solid wheels (solid rubber tires) are all standard on the TR rider sweeper. TR rider sweeper has an on-board, power filter shaker that cleans the polypropylene baghouse style high capacity filter. Manual cleaning of the TR rider sweeper dust filter is eliminated altogether. This baghouse style dust filter is permanent and does not require replacement. The TR rider sweeper hopper can hold up to 4.2 cubic feet of dust and debris. The TR rider sweeper is available with optional aluminum hopper, non-marking tires, and seat belt. Add the optional remote wand (with blower & vacuum) and clean tight corners and hard to reach areas. Other popular options for the TR are the heavy duty side doors & side broom guards, and overhead guard. Give your floors the sweep they deserve. Clean up to 60,000 ft./hr.